Top Statements Of Narendra Modi On His Odisha & Maiden Sundargarh Visit! Only few days remaning for voting day and PM Narendra Modi is not at all giving any diplomatic statements for BJD, the time has changed, the mood is different and the target is to win as many as seats possible. Odisha Shines summed up all his major statements during his recent visit to Odisha and his maiden visit to Sundargarh. On surgical strike: India kills terrorists by entering inside their houses. There were governments earlier too, but they couldn’t even think of surgical strikes… they didn’t have the guts to cross the border by planes and kill the terrorists. Your ‘chowkidar’ is carrying out strikes at terrorist havens, while Congress is trying to remove the key powers of the soldiers. 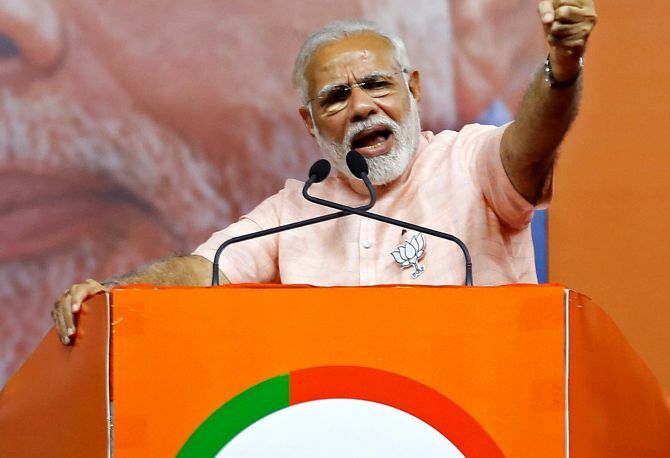 On BJP: In this long journey, the party has been guided by many activists including Deen Dayal Upadhyaya, Kushihau Thakur, Atal Bihari Vajpayee, Lal Krishna Advani, Jagannath Rao Joshi, Rajmata Scindia, Murli Manohar Joshi. I salute every worker of the Bharatiya Janata Party. BJP is the biggest democratic organisation in the world. We are now a strong option to Congress and other parties which were formed from within Congress. On Odisha: The discrimination on the basis of territory that the BJD government of Odisha is doing, the same discrimination the Congress and its allies have done for decades with entire eastern India, he says. Odisha is not poor, there is no dearth of power among the people of Odisha. There is wealth, there are resources and there are also people who will fulfil the resolution. The BJD has obstructed the implementation of financial assistance to farmers, free treatment to the poor under Ayushman yojana. It shows that they have evil and doubtful intentions. This is the first time a prime minister has come to Sundergarh in Odisha. Today, a pradhan sewak of Odisha has come here. You have to decide whether you want an honest government or a corrupt government in Odisha and at the Centre. We are not dependent on money. It’s a party of workers. They have formed the party, they have sacrificed… There are so many parties made up of money. But this party if made up of sweat — the BJP workers’ sweat. BJP workers have sacrificed everything to stand for mother India. From the northeast, BJP’s flag is flying all across India. People of India have given place to the BJP in their hearts. The BJP party exists due to our hardworking Karyakartas (workers), not because of any ‘Parivar’ (family) or ‘Paisa’ (money).